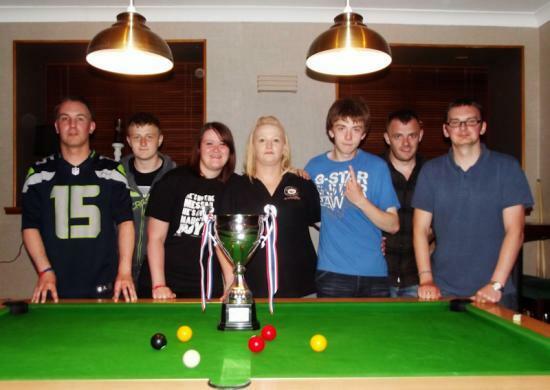 Suzanne Carter's Camps Bar "1" team have won the 2014 Wick & District Summer Pool League Championship after defeating last years winners Queens Hotel 8-7 in the final. After four extremely close frames the finalists were tied at 2-2 in the early stages, but Shane Honeyman defeated Scott Risbridger 2-0 to give Camps "1" a 4-2 lead. Queens captain Perry Campbell took charge of the next two frames with some impressive potting to level the match once again at 4-4. The defending champions would win two of the next three frames with Campbell playing an instrumental part. Dave McGillivray and Shane Honeyman battled hard in the next two frames to help Camps go 7-6 ahead, but Tam Sutherland played well to level it at 7-7 to take the match into the deciding frame. Mark Alexander and Perry Campbell faced off in the final frame, and tension was certainly a factor as both players would fail to capitalize on great opportunities to seal the win. In the end it was Alexander who would sink the black ball with authority to clinch the title for Camps Bar "1". Camps Bar "2" scored an 8-3 win against Retro "1" in the third place play-off match. Ryan Carter knocked in an 8-ball clearance in the opening frame which won him the award for the player with the most total clearances. Both sides played some great pool in a fast paced, high quality match. Shane Honeyman and Ryan Carter won all of their games on the final night and would end the season with an identical record. Both players were awarded joint player of the season for the 2014 campaign. The award for most improved player went to Retro's Andrew Edwards, and Mark Alexander (Camps "1") won best newcomer. Camps Bar "2" 8-3 Retro "1"
From left; Mark Alexander, Aidan Ross, Lesley Ann Begg, Suzanne Carter (Captain), Shane Honeyman, Rian MacGregor, and David McGillivray. 2015 Wick & District Summer League Final. Suzanne Carter's Camps "1" have won the Wick & District Summer Pool League for the second year in a row after a 12-8 victory against Camps "2" in this years final. The 2015 Wick & District Summer Pool League Final will be an all Camps Bar affair as Camps "2" earned the draw they needed on Monday night to secure their place in this years final. Defending champions Camps "1" secured their place in the final last week and made sure they finished the league campaign at the top of the table. Camps Bar "1" have secured a place in the 2015 Wick & District Summer Pool League final after a hard fought 7-5 victory over The Mountain Dew on Monday night. The Mountain side started well thanks some outstanding potting from Philip Hilton as he defeated Ryan Carter 2-0 to help his team take a 3-1 lead. The big match in week three of the Wick & District Summer Pool League saw Camps1 defeat Retro 8-4 in a top of the table clash. The match was tied at 2-2 in the early stages, after 1-1 draws between Greg Thomson & Dave McGillivray and Tam Sutherland & Shane Honeyman. Retro & Camps1 are the only teams to retain their 100% record in week two of the Wick & District Summer Pool League, and will go head to head against each other next week. Retro made the trip out to Lybster to play The Commercial, and kept up their winning ways thanks to a 9-3 victory. The Wick & District Summer Pool League got underway on Monday night, as defending champions Camps "1" got off to a winning start after a hard-fought 7-5 victory against a tough Commercial Side. Ryan Carter, making his debut for Camps "1", won all three of his frames to help his new side earn a 6-5 lead going into the final frame. Camps Bar "2" players Ryan Carter and Bruce Honeyman have won the Bfest Annual Pairs Championship for the third year in a row. The Blackstairs Lounge hosted the weekend event, where teams had to qualify from the group stages to make it through to the semi finals on the Sunday. WIck & District Pool league's 2015 Captains Cup Finalists. One of the best Captains Cup finals in recent memory was won by Ryan Cook by six frames to four Left Ryan Cook, Right Ryan Carter. Queens Hotel are this seasons Wick and District Pool League Division 2 champions, having defeated the Francis Street Club in the league decider. Played in the Seaforth Highlanders Club, this league decider was necessary because both teams finished on the same points with equal frame differences. Steve Atkins' Bayview1 side have won the 2015 Rockwater Shield for a second time after a hard fought victory over the Queens Hotel. The team from Lybster, having previously won this knockout competition and having been strong contenders in league Division One were most people's strong favourites going in to the final against newly promoted Wick side Queens Hotel and indeed ran out 6-1 winners.